I have been working on a Pisces Meets Taurus bag, but the wearer of this bag's name means "Mother of Pearl" so the wave moves into beautiful Mother of Pearl tones. The white was mixed with a shiny silver that gives the bag almost the exact same luster as a pearl; it absolutely gleams in the light. This bag is about the cycle of life. Our life source, water, wraps around the entire bag. Splashes from the wave move into seeds which move into full flowers. As the flowers wrap over the top and to the back of the bag, they go back to seed. Originally from Pakistan, the wearer of this bag wanted her name inscribed in Persian. Ready for all of your accessories, this is a nice size bag measuring 11 inches tall, 18 inches wide, and 4 inches deep. The adjustable strap is 48 inches at its longest and 38 at its shortest. The solid brass buckle is vintage, from the late 60's. I have a limited supply of these buckle. 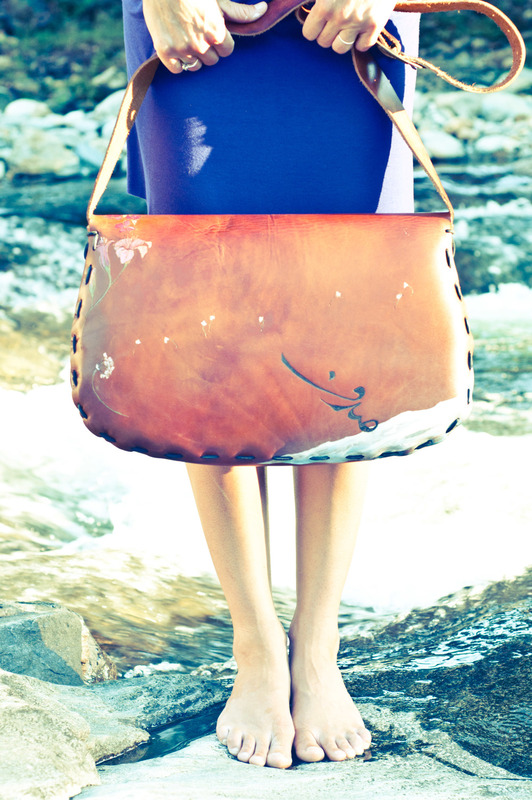 Please send me a message if you have an idea for a custom painted leather purse!